What takes four to five days to set up, 40 to 50 people to run, and serves 900 to 1,000 people for breakfast on the second Saturday of every December? John Freeman’s “Whatever You Think It’s Worth” Annual Christmas Breakfast at the Hardware Exchange on South Sandusky Street in Delaware. Freeman was recently awarded the inaugural “For What It’s Worth People Helping People Award” presented by the local Fraternal Order of Eagles. Pictured, left to right, are Jed Flahive, John Freeman, Keith Anderson and Rick Ringley. The men are just four of the 50 people who have been serving the breakfast for many years. Freeman is the founder of the John Freeman Foundation and John Freeman’s “Whatever You Think It’s Worth” Annual Christmas Breakfast. Freeman said it all started in 1977 with a customer appreciation breakfast at his service station on Sandusky Street. Freeman said he didn’t want to keep the money, so he donated it to those in need in Delaware. He said he donated it to nursing homes or organizations that did things for children or bought books for kids. Freeman estimates that in five hours, he and 40 to 50 volunteers feed 900 to a 1,000 people on every second Saturday of December. He said it takes four to five days to set up everything for the annual breakfast. 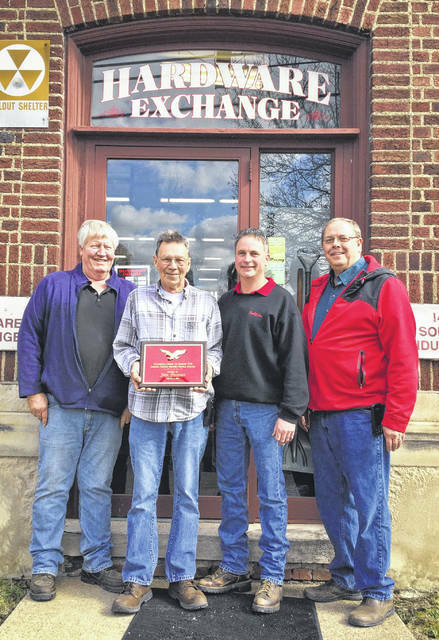 Freeman said after he closed the service station, the location for the breakfast was held at a couple of different places, but for the past 20 years it has been held at the Hardware Exchange, 141 S. Sandusky St. He said all the equipment for the breakfast is stored upstairs at the hardware store. Ken Fink of the Fraternal Order of Eagles #376 said the award combined the order’s motto of “People Helping People” with the name of Freeman’s breakfast. He said the award will be given annually to different people in Delaware to recognize their contributions to the needy. This entry was tagged D. Anthony Botkin, December, Hardward Exchange, John Freeman, Second Saturday. Bookmark the permalink.